Other Sights is pleased to present an excerpt from Storm Sequence, by Australian artist Shaun Gladwell. Other Sights is pleased to present an excerpt from Storm Sequence, by Australian artist Shaun Gladwell. 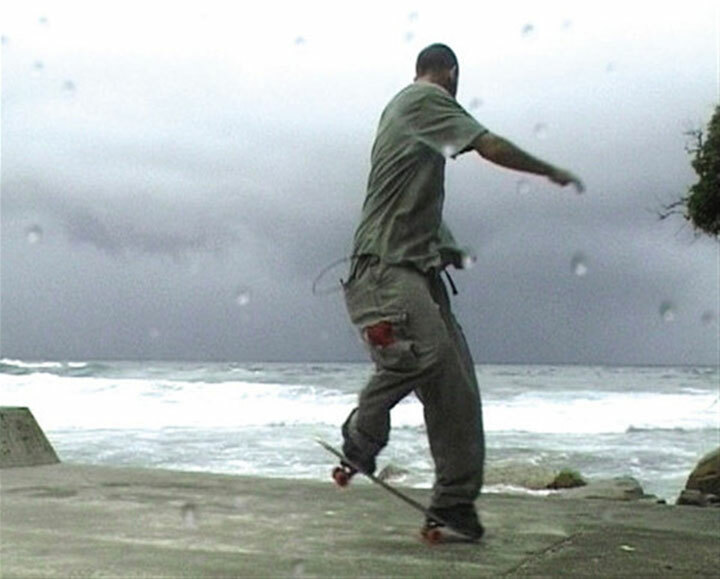 Although filmed on the other side of the world, Storm Sequence evokes our own rainy coast in conjunction with the global urban subculture of skateboarding. In Storm Sequence, the drama and grandeur of a traditional painting of a storm at sea is integrated with the performance of a young man skateboarding on the concrete pilings, caught in that moment of heightened energy just before the storm breaks. Gladwell’s skateboarder depicts a romantic figure of the beauty and self-absorption of youth, and slowing the speed of the image emphasizes the agility and grace of his movement. Gladwell’s work typically explores youth subcultures as a manifestation of physical prowess in relation to urban commerce and architectural space. He positions his work within a tradition of artistic gestures that respond to the city. Storm Sequence is the second project of Looking Up, a curated series of artists’ works that engage with public space and civic agency, presented by Other Sights for Artists’ Projects Association. Other Sights gratefully acknowledges the support of the BC Arts Council and the Canada Council for the Arts.